It can be difficult to properly remove black mold, but there are several methods that you can learn on how to clean black mold. The important aspect of this process is that you follow the right methods in order to completely sanitize the area and prevent future mold problems from occurring. Many people don’t realize that the process of removing black mold is more than just wiping the area down with a rag. When an area is dirty, it can be cleaned by simply using a mild household cleaner and a rag to remove the dirt. But, mold is very different from dirt, because it is a living organism. Microscopic mold spores can spread, and many times those individual mold spores are not visible with the naked eye. In order to learn how to clean black mold, you will need to know about several procedures that will completely get rid of the mold and sanitize the area to kill the mold. We recommend using a professional for mold removal, but if you are going to try cleaning the mold yourself then you should follow these procedures to remove the mold from your home or business. Personal safety equipment should be worn at all times when cleaning mold. This includes an N-95 face mask, eye protection, rubber gloves, disposable protective clothing, head and foot coverings. The first step to remove black mold is to prepare the area in order to prevent cross contamination. The cleanup process will likely send mold spores into the air, and the spores can spread through other areas in the building if precautions are not taken. Large pieces of plastic should be hung to seal off the contaminated area. Duct tape can be used to make sure the seal is tight. Once the area is contained, you can start the process of how to clean black mold. Nonporous surfaces can be scrubbed and cleaned with a household cleaner. Porous surfaces like carpets, drywall and insulation usually need to be replaced. To remove black mold from wooden walls and studs that can't be replaced, you first should vacuum with a HEPA-filtered vacuum to remove as much of the mold as possible. Next, you need to scrape the moldy surfaces with a wire brush. This way you will be able to remove most of the mold that has penetrated the surface. You should spray the surface first with a cleaner to prevent the mold spores from becoming airborne. This should be done in all areas where there is visible mold growth. If the mold is growing on wood, it may be impossible to get deep enough to remove all of the mold. You need to remove as much as you can and then encapsulate the wood. 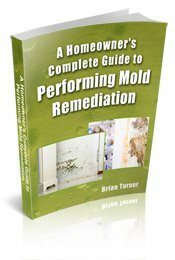 Professional mold remediation companies sometimes sand down moldy wood to remove black mold, but homeowners shouldn't do that because so much mold becomes airborne that it can be dangerous. When done vacuum again with a HEPA-filtered vacuum. Even when the visible mold has been removed, it is still necessary to sanitize the area in order to kill any remaining mold spores. 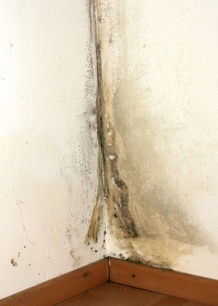 Failing to do this step may result in lingering mold, which can begin to grow again. Some resources suggest treating the area with bleach; however this is not an effective treatment process. The best way to sanitize the area is with a high quality biocide. All surfaces should be wiped down with the biocide, and then the area needs to completely dry before anything else is done. Allowing the area to dry will prevent continued dampness when rebuilding and remodeling is done. Also run an air scrubber for a couple of days to remove any airborne mold. Was All The Mold Removed? The only way to verify that the mold problem has been removed is to test the area for mold spores. A mold specialist can come to your home and perform an official mold test, which will show whether or not the mold problem still exists. Consulting with a professional will give you the peace of mind to know that the mold has been removed, and you don’t need to worry about continued exposure to mold toxins. Click here to find a qualified professional that can test your home for mold. If removing mold sounds like a lot of work, it is. Some people prefer to hire a mold remediation specialist to handle the task, which is especially recommended if you have large areas of mold, mold in hard-to-reach places like inside your heating and air conditioning ducts, or if you have health problems, particularly respiratory problems or allergies. Even if you are planning to handle the mold removal yourself, a consultation with a mold remediation specialist can be beneficial. Most specialists offer free consultations and you can learn valuable information about the mold removal process from them even if you opt not to hire them. To locate a Mold Removal Specialist in your area, just follow the link. Do You Need a Hygrometer?